From the refugee crisis to economic slowdowns in emerging markets, from ever-rising numbers of terrorist and cyberattacks to water shortages, global risks have been in the headlines in the last year. Yet so have initiatives to address them, such as the COP21 meeting on reducing greenhouse gas emissions or European Union (EU) summits to address the refugee crisis.1 The Global Risks Report exists to raise awareness about global risks and their potential interconnections, and to provide a platform for discussion and action to mitigate, adapt and strengthen resilience. There is remarkable stability in this year’s Global Risks Landscape (Box 1.1): many risks that are assessed as above average in terms of likelihood and impact were similarly assessed last year. This suggests the emergence of a new status quo, with geopolitical risks – such as interstate conflict or terrorist attacks2 – being at the forefront. Other risks rated as highly impactful or likely, such as involuntary migration and social instability, are partly a result of spillover effects of insecurity and conflict. Some geopolitical risks – such as the failure of national governance, which is pervasive across Latin America and Sub-Saharan Africa (see Figure 3) and considered to be among the top three most likely risks in the Middle East and North Africa, East Asia and the Pacific, and Central Asia – are considered to be important in some regions but not globally impactful. Consistent with the past, weapons of mass destruction is ranked as the second least likely risk to occur, but the second most impactful if it were to. Part 2 of this Report explores the international security landscape and how it could evolve in future. 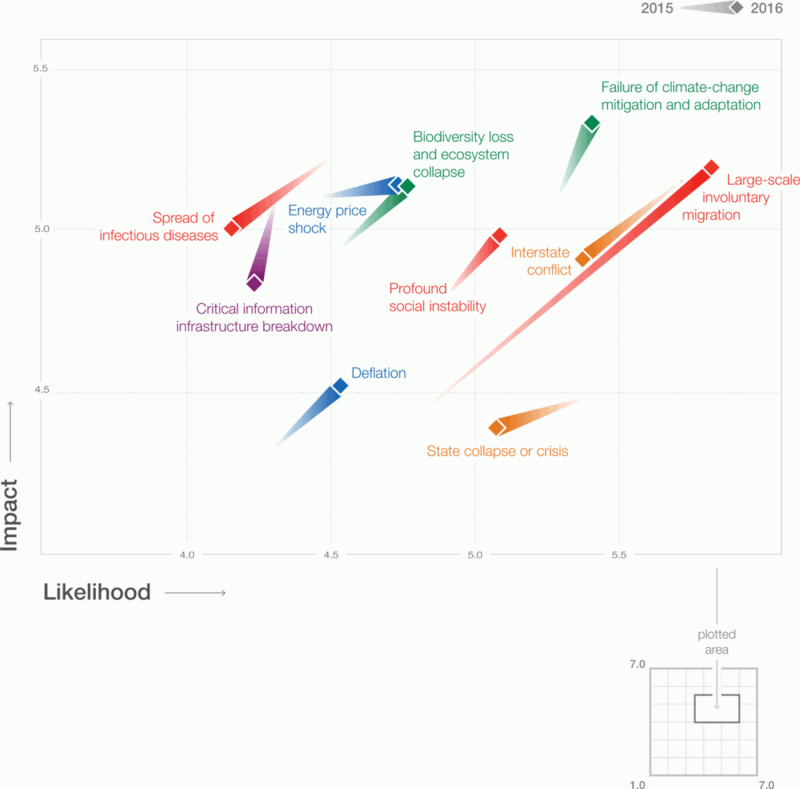 Also prominent in the Global Risks Landscape 2016 are environmental risks such as failure of climate-change mitigation and adaptation, which is considered the most potentially impactful risk and the third most likely, with water crises,3 biodiversity loss and ecosystem collapse rising up the list of concerns. Environmental worries have been at the forefront in recent years (Figure 1.1.1), reflecting a sense that climate change–related risks have moved from hypothetical to certain because insufficient action has been undertaken to address them. Figure 1.1 shows risks that have registered the highest increases and declines in perceptions of likelihood and impact, notably large-scale involuntary migration, now rated as the most likely and fourth most impactful. 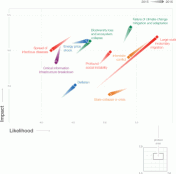 Other risks gaining in prominence on both dimensions include profound social instability – also one of the most highly interconnected risks, as shown in Figure 2. The economic risks of unemployment and underemployment, asset bubbles, and fiscal crises in key economies have increased in both likelihood and impact over the past two years, although these have been overtaken by other concerns. At the same time, cyber threats remain at the top of respondents’ minds, as in previous years. To tease apart short- and longer-term thinking and shed light on the psychology behind the responses, the survey asked experts to nominate risks of highest concern over two time horizons: 18 months and 10 years. Global risks that have recently been in the headlines – such as large-scale involuntary migration, interstate conflict and cyberattacks – tend to feature higher as short-term concerns, indicating that recent events significantly influence our thinking about risks and, hence, stakeholder action. 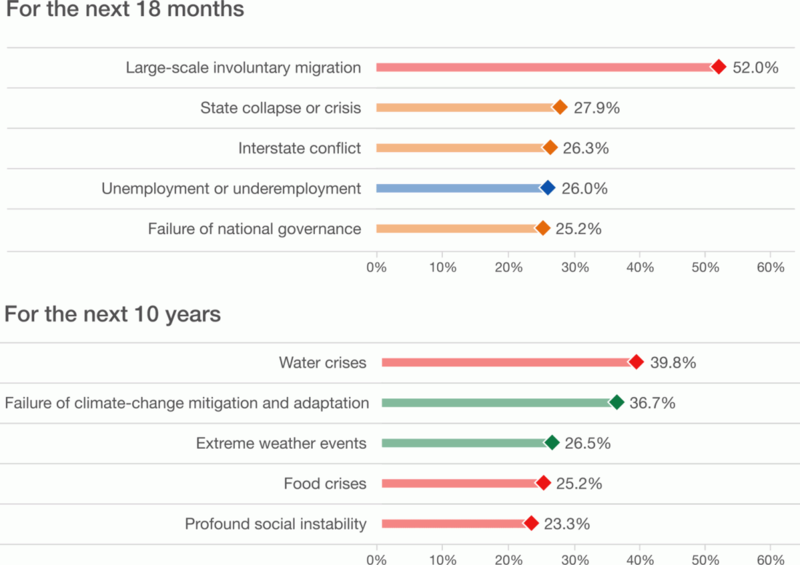 The longer-term concerns are more related to underlying physical and societal trends, such as the failure of climate change mitigation and adaptation, water crises and food crises. Interestingly, extreme weather events and social instability are considered a concern in both the short and long term, reflecting an expectation that the frequency and intensity of crises will continue to rise. One of the roles of this Report is to raise awareness about the importance of long-term thinking about global risks – especially significant when it comes to attempting to limit the extent of climate change and to adapt to the change that is already inevitable. Three risk clusters are discussed in more detail below: the cluster linking the failure of climate change mitigation and adaptation with water crises and large-scale involuntary migration; the cluster linking large-scale involuntary migration with a range of risks related to social and economic stability; and the cluster linking economic global risks with uncertainty around the impacts of the Fourth Industrial Revolution. This Report defines a “global risk” as an uncertain event or condition that, if it occurs, can cause significant negative impact for several countries or industries within the next 10 years. Based on this refined definition, this year 29 global risks were identified and grouped into the five customary categories: economic, environmental, geopolitical, societal and technological. A description of the risks and the methodology employed can be found in Appendices A and B. The Report also identifies 13 global trends that can potentially drive global risks. A “trend” is defined as a long-term pattern that is currently taking place and that could contribute to amplifying global risks and/or altering the relationship between them. Unlike risks, trends are occurring with certainty and can have both positive and negative consequences. Trends can alter how risks evolve and interrelate, and they inform efforts at risk mitigation. As in previous years, assessments of risks in this year’s Report are based on the Global Risks Perception Survey. The survey captures the perceptions of almost 750 experts and decision-makers in the World Economic Forum’s multistakeholder communities and was conducted in Fall 2015. Respondents are drawn from business, academia, civil society and the public sector and span different areas of expertise, geographies and age groups. The analysis takes into account three complementary angles on global risks: an assessment of their likelihood and impact (Figure 1), and how these have evolved over the years (Figure 1.1.1); a regional breakdown of the perceived likelihood of risks (Figure 3); a mapping of interconnections among risks (Figure 2) and among risks and trends (Figure 4); and the difference of the level of concern in the short and long term (Figure 1.2). Source: World Economic Forum 2007–2016, Global Risks Reports. Note: Global risks may not be strictly comparable across years, as definitions and the set of global risks have evolved with new issues emerging on the 10-year horizon. For example, cyberattacks, income disparity and unemployment entered the set of global risks in 2012. Some global risks were reclassified: water crises and rising income disparity were re-categorized first as societal risks and then as a trend in the 2015 and 2016 Global Risks Reports, respectively. The 2006 edition of the Global Risks Report did not have a risks landscape. Source: Global Risks Perception Survey 2014 and 2015, World Economic Forum. Note: We are presenting the 10 global risks assessments that have changed the most since the Global Risks Report 2015. To identify them, we take the distance between the two years for each risk, in absolute terms. Source: Global Risks Perception Survey 2015, World Economic Forum. Note: Survey respondents were asked to select up to five risks of highest concern for each time frame. The percentage indicates the share of respondents who selected the specific global risk among the five risks of highest concern for each time frame. See Appendix B for more details. To ensure legibility, the names of the global risks are abbreviated; see Appendix A for the full names and descriptions of the risks. 1 “COP21” refers to the 21st session of the Conference of the Parties, also known as the 2015 Paris Climate Conference. 2 The risk of interstate conflict has decreased somewhat this year, but remains in the upper right quadrant of the landscape for a second year in a row. In 2014, the two risks were assessed as significantly less important. 3 Water crises is classified as a societal risk, but it is related to both the environment and society at large.